The Yorkshire Dales National Park is one of the most important areas of the United Kingdom for its rich and diverse wildlife heritage and has the largest area of nationally and internationally important habitats of any National Park. This ranges from the wildflower rich hay meadows and pastures in the dale bottoms, through to the moorland fringe with its rush pastures so important for wading birds and the windswept uplands with their open heather moorland and blanket bog, to the unique limestone pavements. Farmers across the Yorkshire Dales have played their part in creating and managing this landscape for many centuries. Management techniques have changed slowly during this time and have helped produce important habitats such as species rich upland hay meadows, flower rich calcareous grassland and wet rush pasture. 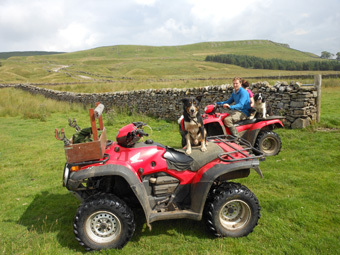 These days, traditional management techniques go hand in hand with some of the modern trappings of agriculture – the indispensable quad bike for example. However, it is the continuation of traditional management, passed down from one generation to the next, that has maintained these special habitats and the species they support. Unfortunately, traditional management is not an economically viable method of agriculture and farmers are being forced to make difficult decisions about improving their business at the expense of the traditional techniques which puts at risk some of the sensitive habitats and species. Upland hill farming has been significantly supported by EU and government schemes which have enabled many farm businesses to break even. The support payments have in part ensured that traditional management practises are retained, that might otherwise have been lost. But have there been hidden costs to the farmer, the tax payer and the environment? 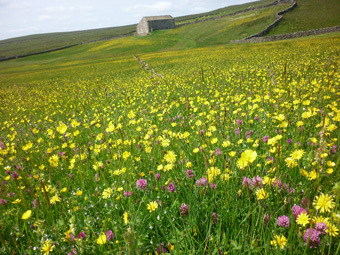 Hill farmers from Buckden parish in Upper Wharfedale have investigated the true cost of being a High Nature Value farmer, to raise awareness of the work they carry out to manage these important habitats and species and highlight issues that need addressing in order to support the continuation of viable traditional HNV farming systems. 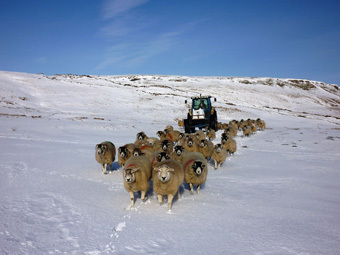 With funding provided by Natural England and help from the Yorkshire Dales National Park Authority and local land agent Windle Beech Winthrop, the farmers took part in an economic study, reviewing financial margins, impact of subsidies and schemes, quantifying the unpaid for aspects of environmental management and detailing the farmers own perspective on the work they carry out. 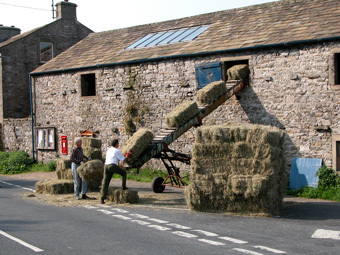 The study found Buckden parish to be an area of high nature value with a broad range of species and habitats and a farming community that is committed to traditional farming and the environment this generates. The environmental assessment identified the parish as being of high nature value due in part to 86% of its area being semi natural habitats. The parish also contains 13 nationally and internationally important habitats and 29 similarly important species including upland hay meadows, calcareous grassland, native woodland, red squirrel, black grouse and Northern Brown Argus butterfly. These are features common to all of the farms within the study area and together, make up a complex network of habitats that enable movement of species around the wider landscape. Two thirds of the farms contain a SSSI, the majority of which are in favourable condition. Survey results show that in general, the habitats are in good or recovering condition with much effort going into restoring the habitats and utilising agri-environment funding to enable this. Species numbers are stable or moderately increasing indicating that habitat condition is suitable. However, the economic study was less encouraging. Profits are marginal with a reliance on family labour. The majority of farms are also tenanted, making investing in new infrastructure or long term projects more challenging. Farmers are working extremely long hours for the equivalent of less than the minimum wage. Profits are marginal at best – on average £16,500, compared to the national upland average of £26,000. The livestock enterprise provides 55% of the total farm income with the remainder coming from Government support payments and diversification. This is a traditional sheep breeding area with all farms having either Swaledale or Dalesbred sheep. These breeds are locally adapted to the terrain and climate and are a key part to the national sheep farming system producing the lowland Mule sheep which in turn, produces the vast majority of lamb meat consumed in the United Kingdom. The farms are mainly moorland fells with very little semi-improved in-bye grassland. This lack of good quality grassland restricts the ability of the farms to finish livestock and therefore make a premium from them. For some farmers within the Yorkshire Dales, this has pushed them to using other sheep breeds that produce heavier, more profitable lambs. 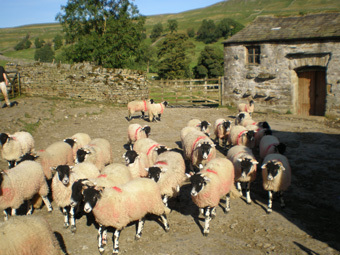 However, in Buckden parish, a number of farmers have signed up to a specialist marketing initiative with Marks & Spencers through the Swaledale Sheep Breeders Association to achieve a premium for their prime lamb. This is a seasonal product with lambs sent through the scheme from January to March each year. Sales at Marks and Spencers are increasing and the scheme appears to be running very successfully for the farmers involved. Nearly all the Buckden parish farms keep cattle despite them being an expensive part of the farm enterprise. Cattle numbers are dropping, partly due to the low returns but also due to the lack of ability to invest in suitable housing and manure storage. However, the parish farmers still see cattle as a key element to the farming enterprise and for managing the habitats. The farmers are keen to explore the possibility of working together at a landscape scale to benefit the habitats and species. This new approach could see them take more control over how these habitats are managed under their agri-environment scheme agreements. They also felt they were well placed to provide further public benefits such as carbon sequestration, improved water quality and catchment management. Providing these wider public benefits was viewed by farmers as a positive opportunity that could diversify their business and help justify some of the existing investment in managing the environment that they already undertake routinely. This in turn would provide a multiplier effect to the income of other rural businesses and sustain the rural economy. The report concluded continued environmental support through Pillar 2 of the Common Agricultural Policy within High Nature Value Farming regions was important to ensure the future of the traditional farming system, development of robust, sustainable farm businesses and a resilient ecosystem.